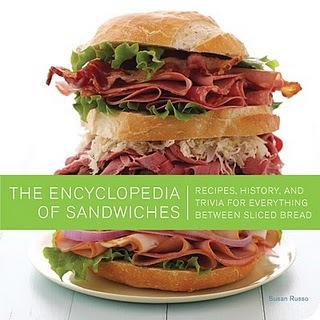 I was sent another great cookbook recently to review, The Encyclopedia of Sandwiches by Susan Russo, Food Blogga. This is a cute little sandwich cookbook, loaded with fabulous pictures by Matt Armendariz, Matt Bites. The cookbook is cleverly arranged like an encyclopedia with fun facts about each sandwich, so it’s fun to read as well as gorgeous to look at. It also includes topping ideas or Mix ‘n’ Match suggestions to change up the recipes. 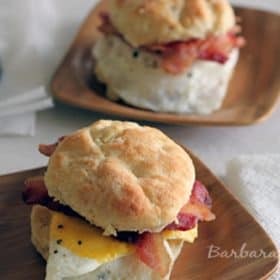 For example, ideas to change up this Breakfast Biscuit Sandwich with ham, sausage or chicken-fried steak, or top it with cheese or country gravy. A great way to start the day. Cut biscuit in half. Spread 2 teaspoons of the butter inside. In a small nonstick skillet over medium heat, cook egg as desired. 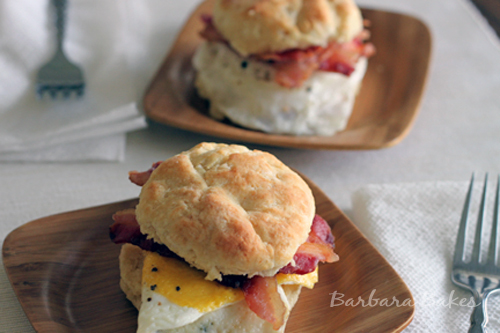 Place on buttered biscuit, top with bacon. Serve hot with remaining butter. Since the cookbook is arranged like an encyclopedia you have odd combinations next to each other, like a Hot Roast Beef sandwich recipe is followed by an Ice Cream Sandwich recipe. It might have been nice to have them grouped by type of sandwich, but I suppose it’s hard to decide whether a sandwich is a dessert sandwich or perfect for lunch like the Nutella Banana sandwich was for me. So many sandwiches, so little time. i have got to get that book. LOVE the breakfast sammie! The sandwiches look great! Love that banana nutella one…;-)) Can’t help…it’s nutella. Sandwiches are great at any time of day. Breakfast sandwiches with veggie filling is my fave. The banana nutella one is a real marvel idea for the kiddos, Barbara. Sandwiches are great huh, when I was an apprentice chef, I worked at the National Convention Centre, the majority of the functions we did we were making sandwiches. One function in particular was 4 days of sandwich making for 1900 people….. We literally had a production line going. Nothing as fabulous as your mighty feasts were created. But a fun memory all the same. And with you reviewing this book, I am sure there are more great sandwich recipes to come in the future. Both the sandwiches look fantastic … I think a lot of folks will move to lighter meals like salads and sandwiches during the warmer months … I can wait to see more!!! These remind me of when I used to make homemade Egg Mcmuffins for my kids. I also love breakfast burritos. I have made a grilled Nutella sandwich, but next time I’ll have to add bananas:) I have a couple of sandwich books that I’m going to have to dig out. Your sandwiches look yummy! I made biscuit sandwiches for breakfast yesterday morning! Yum. Sounds like a great book filled with great sandwich recipes. 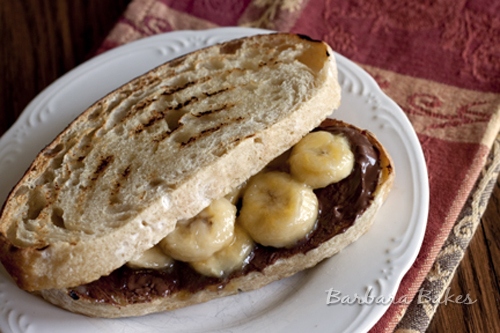 Whoa, that nutella banana sandwich looks amazing. What a great book! Your sandwiches are causing me to want sandwiches for three meals a day…plus snack. Wonderful! Ain’t that the truth -” so many sandwiches so little time” It certainly looks like a “Dagwood” sandwich on the cover. I love nutella and banana and peanut butter…your sandwiches look so good! I love dessert, but I think breakfast is my absolute favorite meal — and a breakfast sandwich sounds BEYOND delicious. I want one right now! The book looks fantastic. Love a great sandwich.